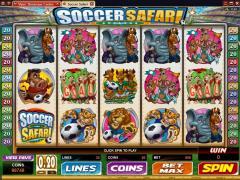 Soccer Safari is a football themed slot game, but it has animals playing football. 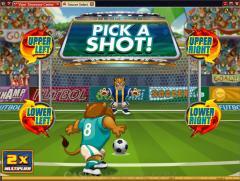 The introductory clip shows the Lion scoring a goal. The reels are set in the background of a stadium. The other animals playing football on the reels are the Rhino, the Leopard, the Hog, the Buffalo and the Jackals. The Leopard is the goalkeeper. Some Deer are the cheer leaders and a pack of Hyenas are the crazy soccer fans. The Elephant and the Giraffe are the commentators. The Zebra is the referee and is a scatter symbol. The slot game has a second scatter symbol, which is the Trophy. 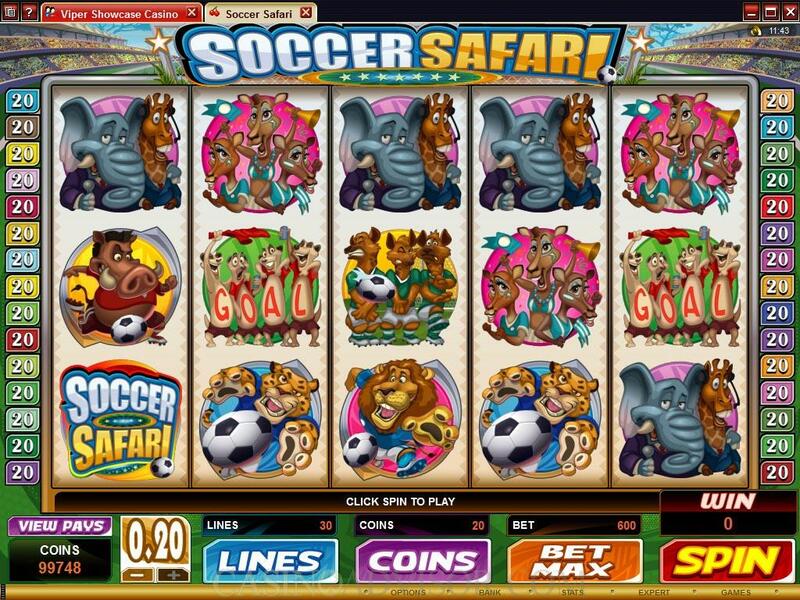 The Soccer Safari Logo is the wild symbol and also provides the highest jackpot. All the animal symbols have a comic touch with excellent detailing. Soccer Safari has 30 paylines and players are advised to ensure all are enabled. On each line players can wager up to 20 coins and this introduces required flexibility in the betting options. The coin size can vary from 0.01 to 0.20. These parameters give a total bet per spin of 120.00, which is bound to attract high rollers. The Trophy symbol offers scatter payouts when two or more appear anywhere on the reel. When three or more of this symbol appear then the Go For Goal bonus game on the second screen is triggered. In this game the player has to first choose a team. When he does so, the screen displays a number of animals wearing the team’s colors. The player has to select one animal to take the penalty kick. The Leopard is in the goal. The player has to pick from one of the four corners of the goal. If a goal is scored then a multiplier is revealed, which is applied to the total bet. If the goal is saved, even then the player is awarded a consolation multiplier. In all a player can win up to 60,000 coins in this game. If the Zebra symbol appears anywhere on Reels 1 and 5 simultaneously then the free spins round is triggered. Though there are only 5 free spins awarded the payouts are bound to be huge. The Zebra symbol expands on Reels 1 and 5 and becomes a wild symbol. This increases the likelihood of getting five like symbols in an enabled payline. The three center reels only spin 5 times. Once the free spins are complete, the center reels are held and Reels 1 and 5 spin again. If these again have the Zebra symbols as required the free spins will be retriggered. Soccer Safari also has the Microgaming Gamble Game. After every payout players have the option to stake the amount in a bid to double or quadruple it. Players should exercise this option with caution because they will lose their payout if they fail. Interested in reading more detailed information about Soccer Safari? If so Click Here for more details.